Cooking can be an art to some, while for others, they claim that that it is chemistry. Regardless, as long as the dish turns out to be delicious in nature, it should not really matter just which particular viewpoint you come from. 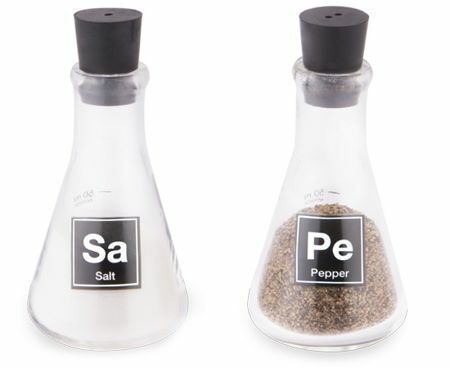 Experiment with future meals with the $14.99 Lab Flask Salt and Pepper Shakers, where it will definitely add some flavor to your meals, and who knows, it might also entice that science mad child of yours to stop whatever experiment that is happening so that he or she will come down from the attic to have something to eat. Each set purchase comprises of two shakers, where individual shakers will measure 4” in height.